As of now, MA Chidambaram stadium in Chennai also known as Chepauk stadium is scheduled to host the Indian Premier League 2019 (IPL 2019) first Qualifier and final. The defending champions, as per the rules, gets to host one playoff and final match. So, this year’s final will be played at Chennai Super Kings’ (CSK) home ground regardless they make it to the final or not. However, empty seats at the MA Chidambaram stadium could lead to IPL 2019 final being shifted to a new venue. IPL 2019 Playoffs Schedule Leaked: Official Website Reveals Time Table & Dates by Mistake. Three stands at the MA Chidambaram stadium, I, J and K are under legal issues following their construction and the High Court in Madras has put a stay on the use of those stands. 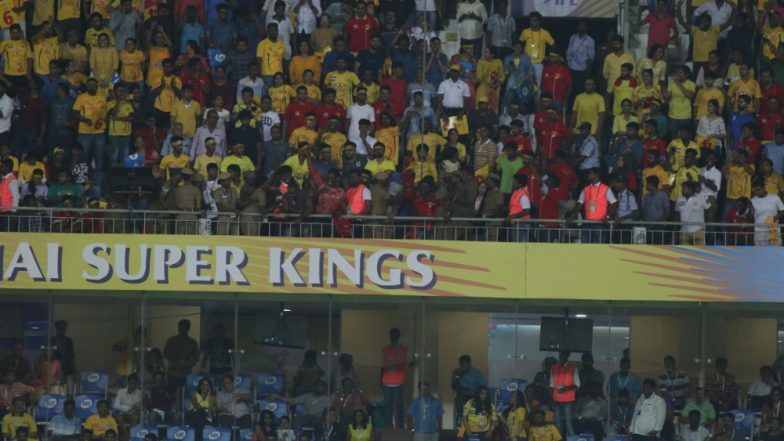 Meanwhile, Board of Control for Cricket in India (BCCI) reportedly is concerned about the three empty stands and is looking to shift the IPL 2019 final out of Chennai if the stands continue to remain unused. The BCCI officials are likely to meet Tamil Nadu Cricket Association (TNCA) members in this regard. “We are making efforts. However, since it is the time of the general elections, the political leadership and the administration is very busy in their own spheres. Let us see how it goes,” the TNCA official was quoted as saying by IANS. CSK vs KKR, Stat Highlights: Chennai Super Kings’ Bowlers Help Them Beat Kolkata Knight Riders by Seven Wickets. “See the thing is that the playoffs and finals are games where the revenue goes to the board. Unlike other games, the gate money from the knockout games goes to the board and we don’t wish to put them in a fix. The organisation’s position must also be seen,” the official further added. CSK have thus far played four matches at the MA Chidambaram stadium and in all those matches the three stands remained unused. The defending champions will host three more matches at the venue and the stands will continue to be empty.